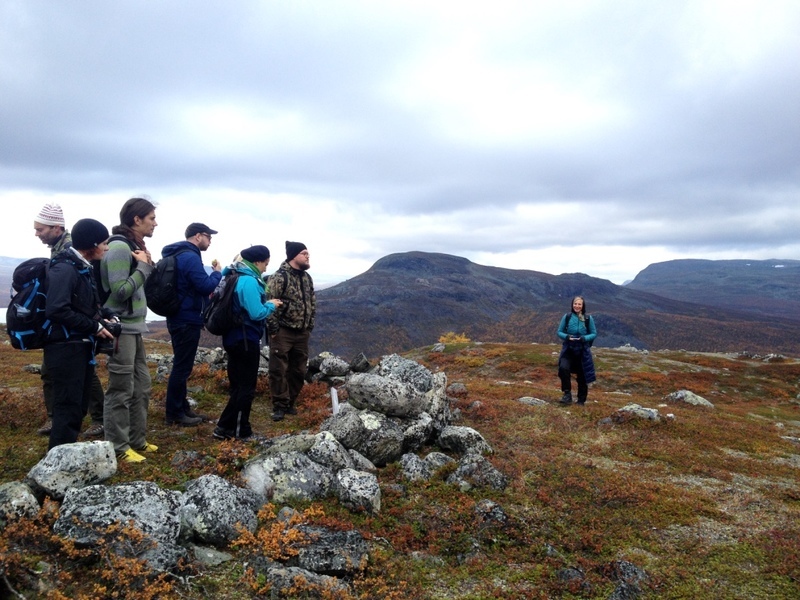 First day on the Field_Notes trip: We are hiking through layered landscapes with one of the groups at the Hybrid Matters Field_Notes. 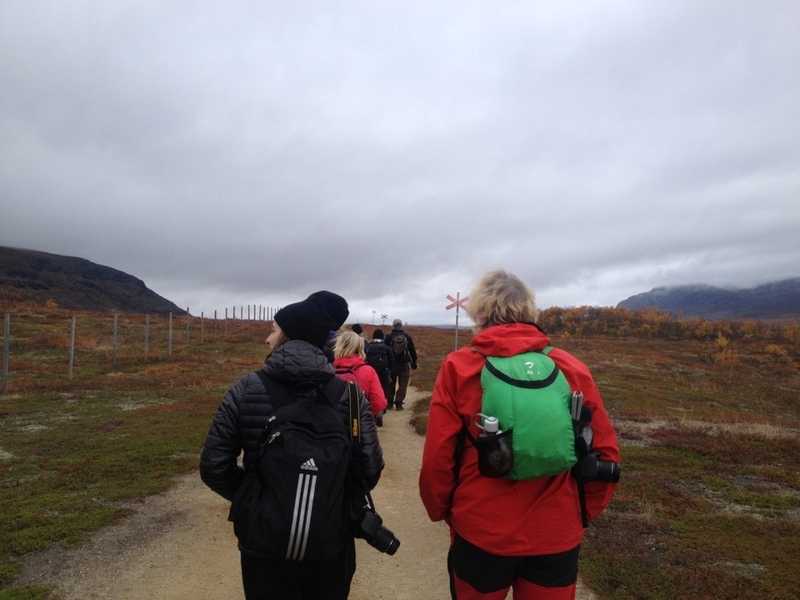 Still strangers to each other we are talking, listening, photographing, recording, and pointing out and gathering things as we walk along the human-reindeer carved paths towards a World War II plane crash site. Suddenly we stop, bodies and voices are lowered and assembled, and gaze at a naked birch tree where an owl is posing nicely for us. Cameras are clicking and binoculars are generously traveling from eyes to eyes. Nine people, who are not yet familiar with ‘looking together’, stare at the same spot observing a Northern Hawk Owl through the same lenses – but are they seeing the same? What does the owl see as it curiously looks back at us with three times better vision than humans. And do researchers from the Second Order Group (SO) see the same as the artists in the group do? Are our observations closer to those of the owl observing us observing it? 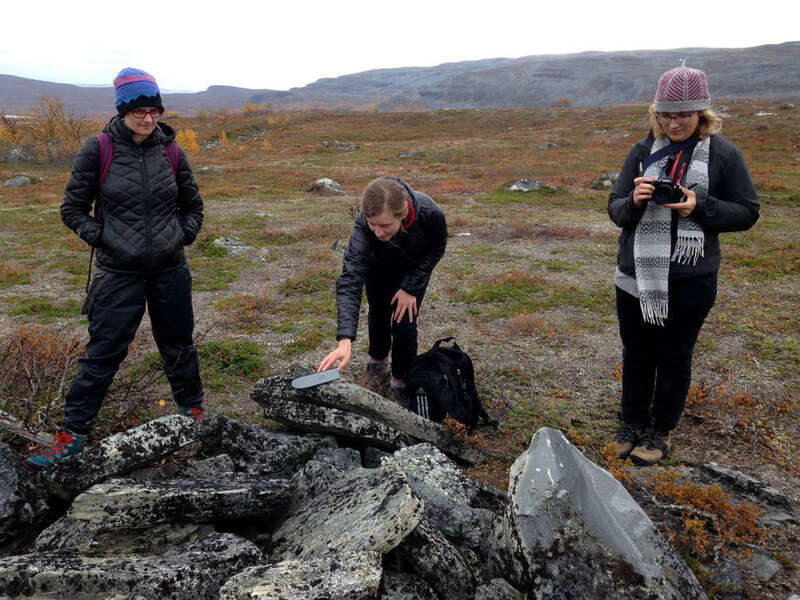 As members of the Second Order Group, we are invited along to the arctic to observe groups of artists and researchers engaging with hybrid matters of landscapes, nature, animals and man-made earth. 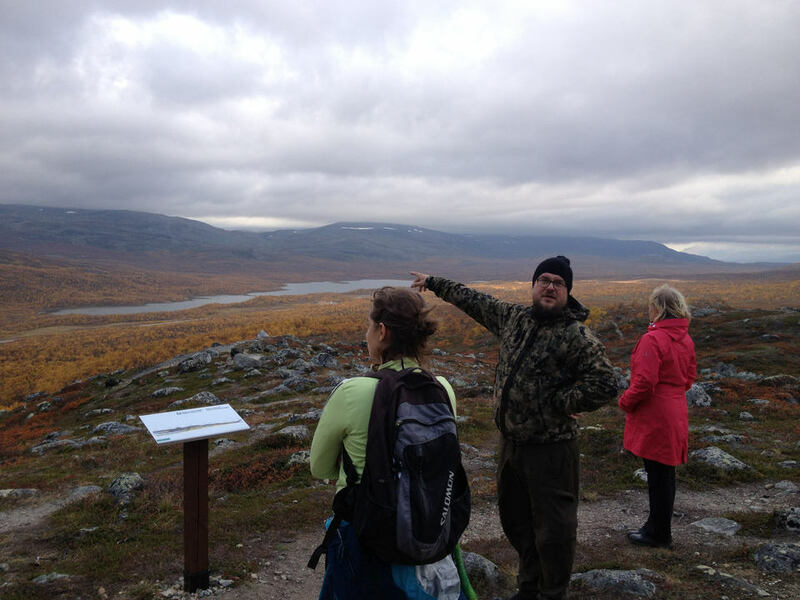 The act of seeing-together and of observing the arctic nature creates an intimate and caring space. The owl does not seem to mind the attention nor does it lose the interest in us. But we have to continue walking. After a while we discover that the owl is curiously following us for hours down the valley. Back home at the Kilpisjärvi Biological Station, which we are temporarily inhabiting, evening has come and everybody’s eyes are directed towards the ‘PostNatural’ presentation, watching laboratory rats, farmed salmon vaccinations, a curved crocodile jaw, and Birmingham Rollers (a breed of domesticated pigeon suddenly tumbling backwards while flying). A loud bang against the dark window and outside ‘our owl’ is tumbling around on the tiles looking intensely up at us. It has been watching us watching the ‘postnatural’! The owl eyes seem to ask: Who observes whom? And we may ask back: How can we approach nature? What conceptual frameworks hybrid natures count here? How is the observed observing back? Is observation an intervention, an interference? What means Second Order observation, when the object of case study becomes the watcher? 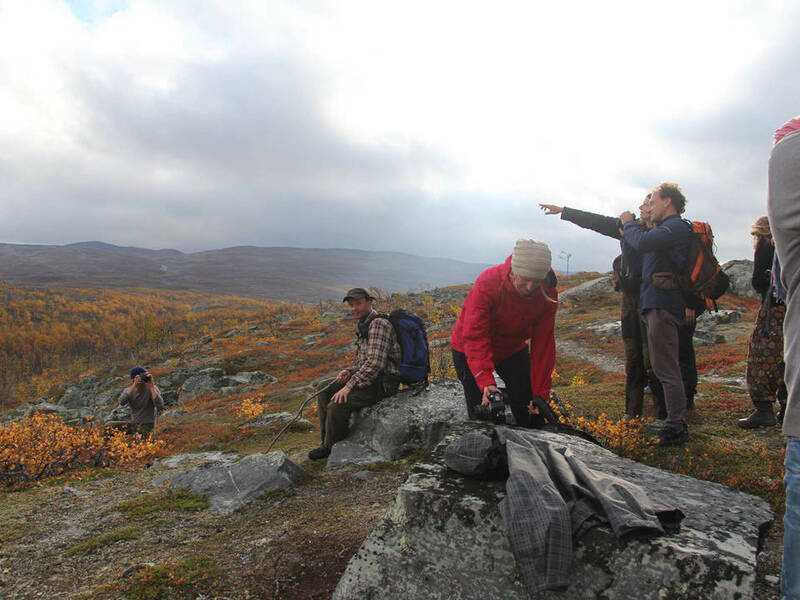 We are 370 km north of the Arctic Circle in the north of Finland in the Kilpisjärvi Biological Station, where about 40 people – mostly artists, some curators, social scientists, and biologists – are on a Field_Notes trip searching for Hybrid Matters in the local area. Whereas the other four groups have predefined topics to inquire into, the mission of the Second Order group (SO) is to (re)search them. SO consisted of seven interdisciplinary researchers (philosophers, social scientists, curators, art theorists, and activists). Our aim was to look deeper into how an interdisciplinary, temporary assemblage of people, knowledge and matters responds to the landscape and if necessary intervene into their maybe consensual maybe divergent dynamics. In order to study the week program in various ways we established two different modes of second order observing. Some of us joined a group for the whole week, others worked as ‘nomad ethnographers’ migrating from group to group. 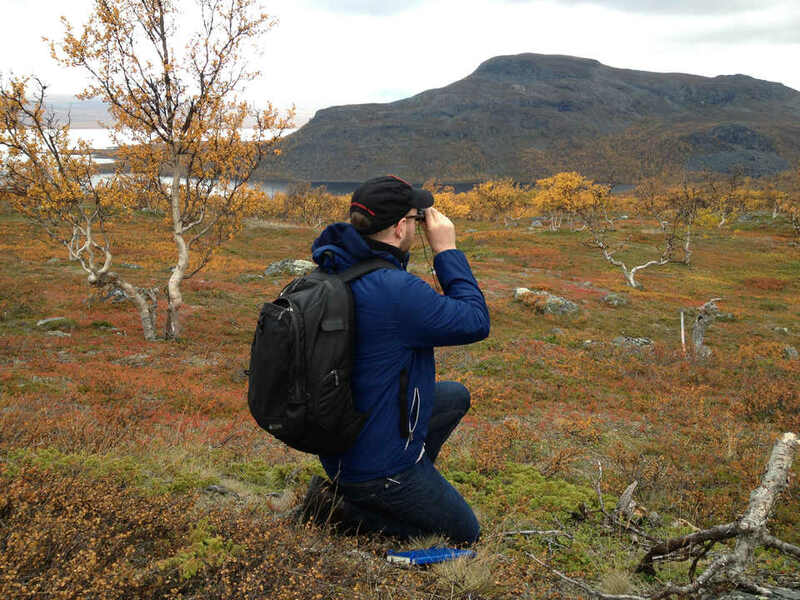 While the group ethnographers had the privilege of getting to know their groups rather well – with the risk of ‘going native’ – and to experience the group dynamics changing over the week, the nomad ethnographers were in a position to observe differences between groups and to observe the observers observe the groups. During the week we came to see the role of the nomad ethnographers as “Third Order” and the owl became the “Fourth Order”! Being in the Second Order group was indeed a self-reflexive and hybrid experience of defining our own role - to ourselves and for the others. Also our informants – the rest of the Field_Notes participants – took active part in defining our roles. From the first evening we were named ‘The Spy Group’. After having digested being considered as such we started using the term as productive force by adding the antipodal term “transparency” to “spying”. We made our observations and conversation public to our informants (or our suspects, to stay with the crime-metaphors). We posted our notes on the fridge in the kitchen area. We drew a public map for exchanging experiences (maybe a moment of commoning). Out of our observations and discussions questions emerged, which we posed on a flip board by the dining hall: Who is the Expert? Who is indigenous? SO became kind of visible all over the place and asked people to join the transparency spying. Squeezed in-between the observations of the groups we got together and shared and discussed experiences. Whereas analyses are yet to be made in order to make sense of our work, one interesting observation challenged our methodology. We started with the expectation to employ two or three generalizable methods for gathering data and intervening across the four groups, however we quickly realized that our options for observations and the possible space for intervention were enlarge determined by the different groups’ methodological approaches, their topics, techniques, group dynamics, their language and skills. Instead we had to be flexible and change practices according to our fields. Our roles became simply a ‘Hybrid Matter’, and throughout the week our roles were continuously redefined by our field. We were re-named into anthropologists, mediators, reflexitionists, evaluators, noisy Southerners, audience, and not least as native members of the groups. 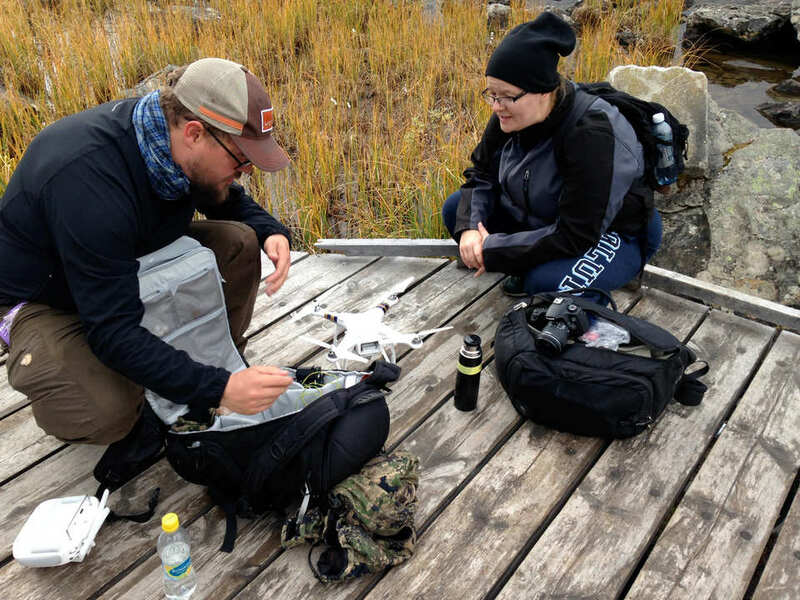 What we took with us home from the arctic and artistic environment were numerous questions regarding what it means to study people and how our own roles were both internal and external to the various species of study – both humans and animals.